Glo is here again with two new Amazing service which they call the Glo Sharp Sharp E-Top up. 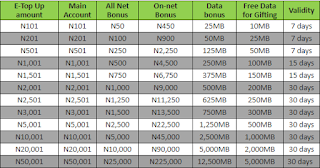 This new offer by Glo is targeted at Glo users who recharges with the available top-up channels. The Glo Sharp Sharp E-Top up is the latest offer by Glo which gives users 8 times the value of thier recharge whenever they top-up their line through any of the electronic channels available such as the ATM, POS or even the new Glo café app. Online – Gloworld.com, Quickteller, Konga, banking apps, etc. Gloworld, Glozones and authorized Glo dealer outlets. *805# Glo easy recharge solution. POS terminals in select retail mega stores such as Shoprite. What this means is that if you top-up your line with N200 airtime, you will get airtime and data bonus worth over N1,600 which will include your N200 main airtime, N100 bonus airtime to call all network and N900 bonus airtime to call other Glo users. On top of all that, you will still receive 50MB data to browse and another extra 25MB data which can be gifted to other Glo users. I don't think it can get better than this. 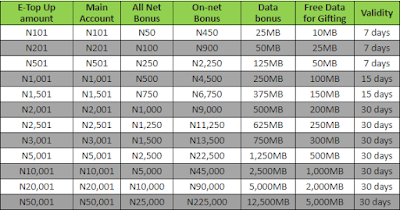 Check out the table below for the exact bonus a customer gets on all airtime top-up. If you don't know how to check the glo etop up bonus you can do so at any time by dialing #122*40#.